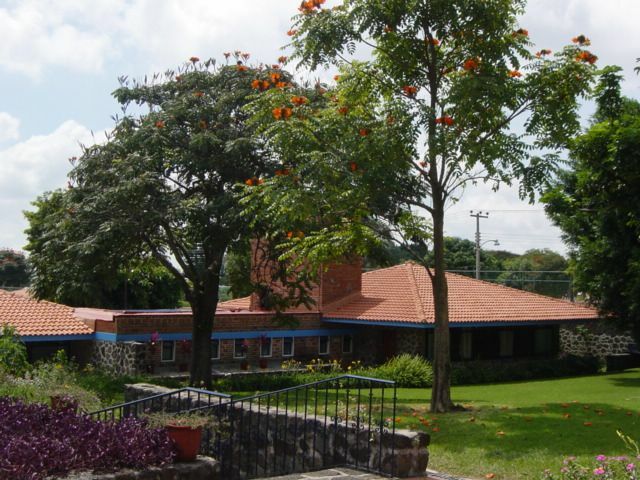 September 15th through October 15th is celebrated each year as Hispanic Heritage month, and there’s no better time than to talk a little bit about Our Cabaña in Cuernavaca, Mexico! WAGGGS (World Association of Girl Guides and Girl Scouts) has four World Centres across the globe: Pax Lodge in London, Our Chalet in Switzerland, Sangam in India, and Our Cabaña. There are over 10 million Girl Guides and Girl Scouts in 146 countries around the world and these centers offer the chance to experience the unique culture of different countries and their traditions, history and people. Girl Guiding began in Mexico in 1930 and in 1948 a National Association, Guías de México, was formed with a program adapted to the customs of Mexico and the specific needs of Mexican girls. 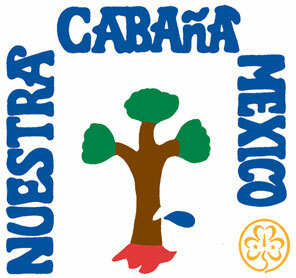 Our Cabaña was officially opened in July of 1957 and is now the largest of the four World Centres. Cabaña means “hide-away cabin in the woods, surrounded by nature.” While the city of Cuernavaca has grown to become a sprawling city of one million people, Our Cabaña is safely located in its leafy suburbs. The Guías de México are divided into levels according to age, just like the Girl Scouts of the USA. The levels are Girasol (Sunflower) 4-6, Hadita (Fairy) 6-9, Guía (Guide) 9-13, Guía Intermedia (Intermediate) 13-15, and Guía Mayor (Ranger) 15-18. A Guide is a friend of all and sister to all Guides. A Guide is a friend of animals and plants in nature and sees God’s work. A Guide obeys orders. A Guide faces difficulties with fortitude and optimism. At GSUSA’s 2011 National Council Session and 52nd Convention in Houston, Texas, many adult Girl Scouts wore vintage uniforms to celebrate the Girl Scouts’ 100th anniversary. 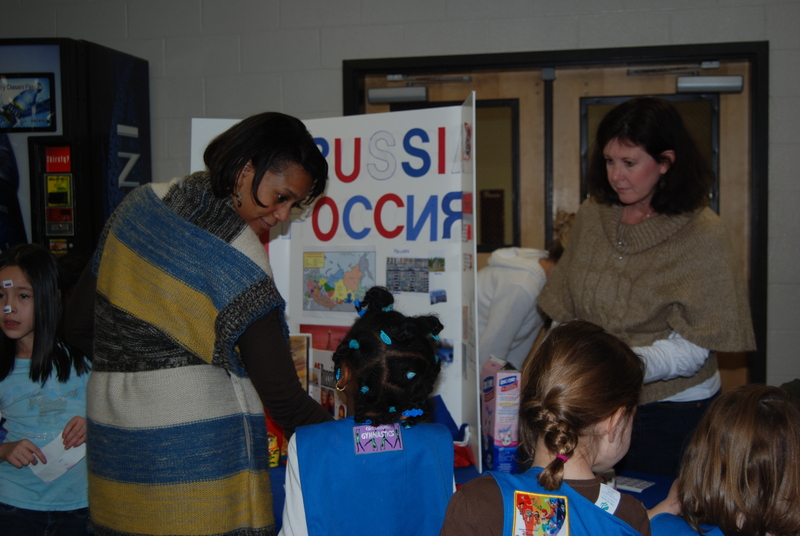 Girl Scouts of Greater Atlanta’s History/Archives committee members also participated in this fun activity. Gigi Baroco wore a Norfolk khaki uniform from the mid-1920s and Joyce Overcash-Dudley wore a Mariner uniform from the late 1950s. Joyce made both replicas. The convention’s theme was “Renewing the Promise: Girl Scouts in a New Century” and the Take Action Project continues to be “Forever Green.” The opening ceremony was grand, with uniformed girls carrying the 145 colorful flags of the WAGGGS members, followed by girls wearing 1912 navy blue replica uniforms and carrying the green 100th anniversary flags. More girls attended than ever before and the ten Women of Distinction inspired us all. The girls who attended the Girl Scout Leadership Institute had experiences that demonstrated that 2011 Girl Scouts do have courage, confidence and character. During the convention, Kathy Cloninger was given a warm “goodbye” and Anna Maria Chavez was welcomed as the new CEO of GSUSA. There were fewer proposals to the Blue Book this time and many more break-out sessions and activities. “Conversations of Consequence” covered topics such as, “Be a Leader, Not a Bully;” “Girl Scouts Explore the Female Factor” led by Susan Cartsonis, film Producer and President of Storefront Pictures; “Moving Beyond Diversity to Inclusion” led by CNN’s Soledad O’Brien; “Nobody’s Perfect” led by actress Marlee Matlin; and many others. Guest speakers and Center Stage performances included ABC’s Katie Couric, Robin Roberts and Cheryl Burton; Ingrid Saunders Jones, SVP of The Coca-Cola Company; combat pilot Vernice “Fly Girl” Armour; actress Monique Coleman, the Harlem Globetrotters which now has a female player; a Justine Magazine fashion show; singing by Yolanda Adams, Katie Armiger, Sara Bareilles, Emily Hearn, Mindless Behavior and others. Hall of Exhibits. Photo courtesy of Meg Rickert, History/Archives Committee Member. The Hall of Exhibits featured a Global Lounge with representatives from WAGGGS, the Girl Scout Superstore, eighty commercial vendors, twenty not-for-profit organizations offering programs and resources, a Storytelling Lounge, and Swap and Meet booths. 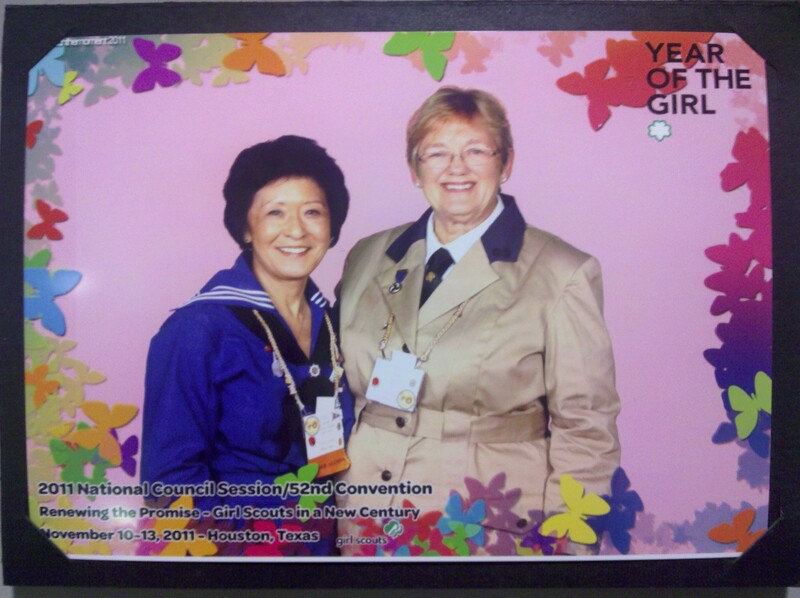 Joyce and Gigi were amazed that they ran into so many Girl Scouts that they knew among the over 12,700 attendees. On Saturday the attendees topped out at over 15,000 Girl Scouts. 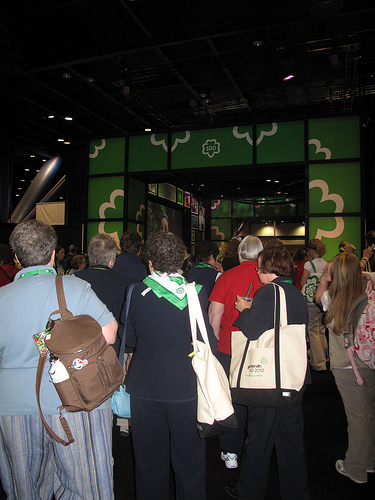 If you haven’t attended a Girl Scout convention, you should try to get to the next one. It will be in Salt Lake City in 2014! 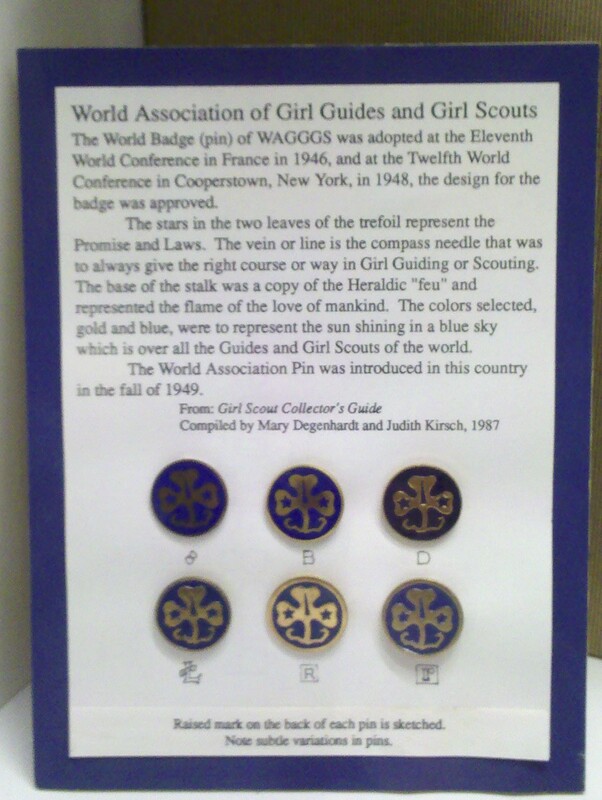 A small exhibit on the WAGGGS pin at the Girl Scouts of Greater Atlanta Council Headquarters. 2011 is our second centenary year, and we are once again celebrating 100 years of changing lives on 10 April. Join 10 million Girl Guides and Girl Scouts around the world in commemorating this very special and historical occasion. 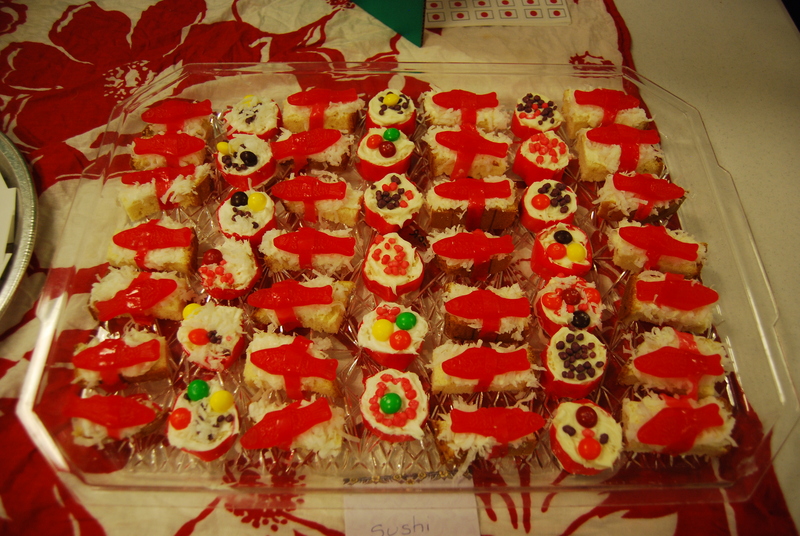 In 2010, our first centenary year, Girl Guides and Girl Scouts globally were united in celebrating with parties and activities on the theme of ‘Plant’. You can read all about the celebrations in our special centenary section. This year, the theme is ‘Grow’, and we’re asking Member Organizations to grow their celebrations through community action. 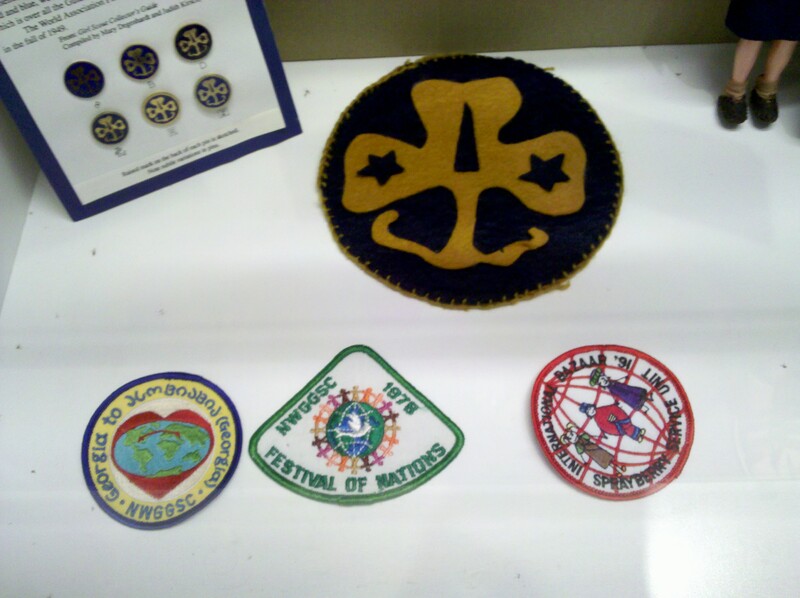 A few of our international patches from the Archives collection on display. Every day you get a chance to make history. One suggestion is to make a pledge on how you will bring about positive change in your community – just like the young women did at the Young Women’s World Forums, the key centenary events. At the events, delegates wrote their pledges on t-shirts. Why not write your pledge on a t-shirt and send WAGGGS (and GSGATL) your photo? Or send a video message outlining your pledge? Send photos or videos to: centenary@wagggsworld.org and they’ll post them on the WAGGGS website. Please also send in the ways you are celebrating with your Greater Atlanta troops to bmesser@gsgatl.org so that we can document our area troops’ activities in this wonderful world-wide event! This badge is a great one for a new Girl Scout to work on, as it gives her a better appreciation of the organization to which she now belongs. It also discusses and lets the girls explore some of the most important traditions within Girl Scouting. The building on the badge is a depiction of The Girl Scouts Chalet in Adelboden, Switzerland, affectionately called “Our Chalet.” To earn this badge, a Junior must finish six of the ten suggested activities. All Girl Scouts wear this WAGGGS (World Trefoil) pin as part of their official uniform. As a Girl Scout, you are not only a member of Girl Scouts of the USA, but also a member of the World Association of Girl Guides and Girl Scouts, known as WAGGGS. As a WAGGGS member, you are part of a sisterhood of millions of girls who share many of your Girl Scout values and traditions. This badge will help you discover the global reach of the Girl Scout community. Thinking Day: Thinking Day falls on February 22 each year. Lord Robert Baden-Powell, the founder of Boy Scouting, and his wife, Lady Olave Baden-Powell had the same birthdays on that day, so February 22 was chosen as a time for Girl Scouts and Girl Guides to celebrate international friendship and world peace. Plan a way to celebrate Thinking Day that recognizes your Girl Scout connection to girls around the world. WAGGGS on the Web: Check out the WAGGGS website to find out about the different countries that are members of WAGGGS, and the projects that are being sponsored by that organization. Share what you learned with your troop, group, or other girls. Show the World: Create a display that shows how Girl Scouts are part of a world sisterhood. Exhibit your display for Girl Scout troops or groups, your Girl Scout council, your school, or a local library. Connect with Younger Girls: Create a game or storybook for younger Girl Scouts and Girl Guides around the world. Try out your game or storybook at a neighborhood event, at camp, or at a bridging ceremony for younger Girl Scouts. Girl Scout Central: Visit Girl Scouting’s official online site for all things Girl Scout: Girl Scout Central! Click on the link to WAGGGS to find out more about this world-wide organization. Also look at “travel” and check out special international places you and your Girl Scout friends might want to visit. Girl Scouting’s Founder: Juliette Gordon Low: Find out about the Juliette Gordon Low World Friendship Fund. What does this fund do? How do girls all around the world benefit from the money in the fund? International Expert: Choose one country where Girl Guiding/Girl Scouting exists. Become an expert on that country and the activities girl members can do there. Learn a game, song, craft, recipe, or activity unique to that country and share it with others. World Service: Find out about a world problem that affects girls your age. You could think of a problem related to the environment, hunger, poverty, illiteracy, or another issue. Share what you have researched with other girls and think of some ways girls in WAGGGS could help solve this problem. Common Roots: Learn about the lives of Lord and Lady Baden-Powell. Also find out about how the Girl Guide movement came about. Share your information with members of our troop/group or with a Brownie Girl Scout troop. 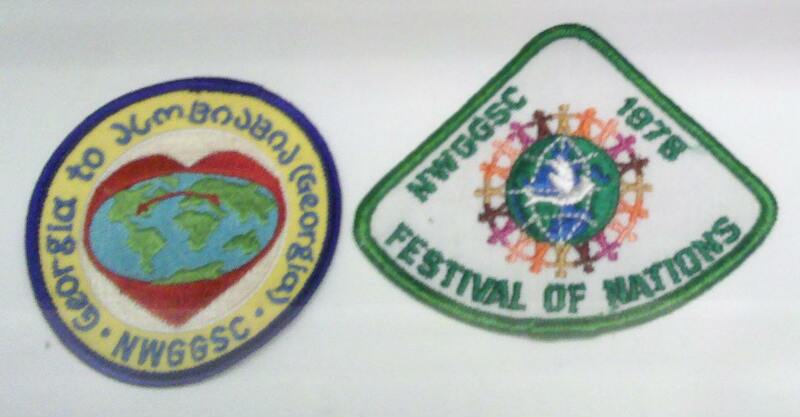 WAGGGS Travel: WAGGGS has four World Centers that any Girl Scout can visit. Find out the following about each of the four centers. Where is it? How can you get there? What types of events and activities can a visitor take part in there? You can find this information online at the WAGGGS web site.